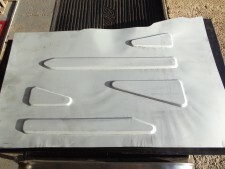 We were restoring another MGC Roadster (April '08) and were totally fed up with the poor quality of the MGC front floorpans so I decided to manufacture a press tool to make both O/S and N/S panels. 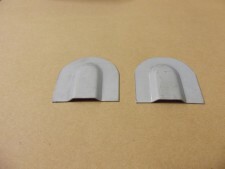 The pressings are 5mm deep and shaped for only minor fitting to be required. 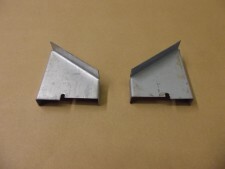 A pair for £135.00 plus VAT or £75 per side plus VAT. 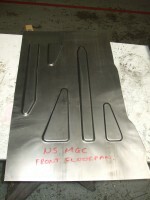 This is the O/S MGC floorpan and these items are available from us at £75 each plus VAT or £135.00 plus VAT for a pair. 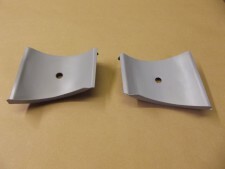 We are also now making the torsion bar support panel for both the O/S and N/S. These have sold well and we have made some new tooling to make them even better than before. The N/S panel as shown in the photo is £165.00 plus VAT and the O/S with the pressing and fittings for the wiring loom is £225.00 plus VAT or the pair can be had for £350.00 plus VAT. 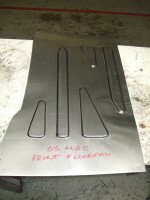 This is the O/S torsion bar support panel with the pressing and fittings for the loom and pipes. 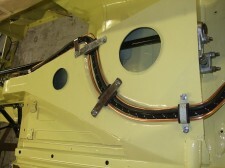 Also has the bends in place so that only minor fitting is required. 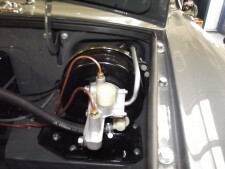 This is how our panels look when fitted and painted on our MGC. 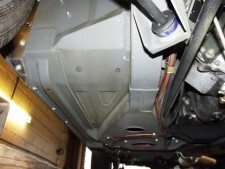 And this is how the floor pans look from the underside. To compliemnt the other panels we have made we now produce the support panel that fits between the floor and the torsion bar panel. £55.00 each. 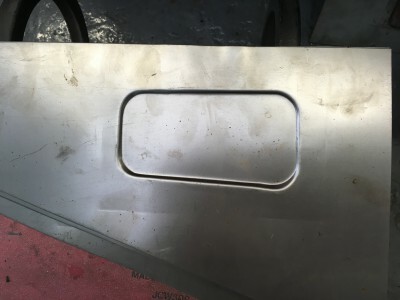 To make the car look right why not fit these drain hole covers. £6.00 each plus VAT. Sill finisher piece. £12.00 each plus VAT. Correct servo pipe for the Girling Mk2b servo. To replace the the Austin pipe that is often found on MGCs that rubs on the bonnet. £48.00 plus VAT. 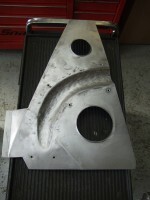 MGC Inner wing repair panel. 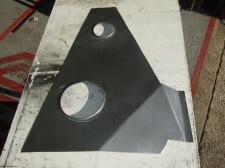 This is an inner wing repair panel that is often correoded. On the RH the panel is solid but on the LH has the middle removed. £35.00 plus VAT.